FLUFFY is a truly amazing kitty who has been through so much in his short life. He is a sweet boy who is both bold and a little timid. Once Fluffy feels secure in his surroundings, he races around with confidence. He bats toy mice around and even chases his own tail! 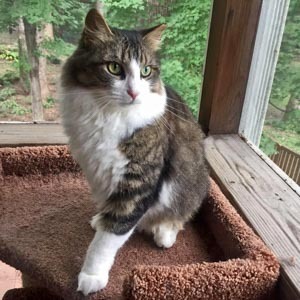 Fluffy also LOVES spending time on a screened-in porch. Fluffy is bold when it comes to other cats – he runs right up to them to touch noses. Fluffy has come a long way. He was initially terrified of everyone, then comfortable only with his foster mom. Now he greets guests in his foster home by rubbing up against them and asking to be petted. His foster mom can pick him up and carry him around like a rag doll. Fluffy likes to be petted and brushed when he's in the mood, but he also gets a little nippy when he's over-stimulated, or is not in the mood for being handled. 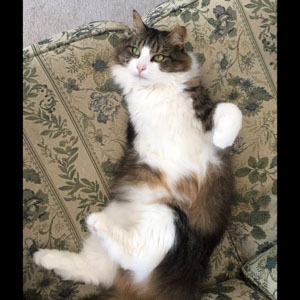 Fluffy needs a quiet to moderately active home that is not expected to change a lot over time and has no young kids now or in the future. 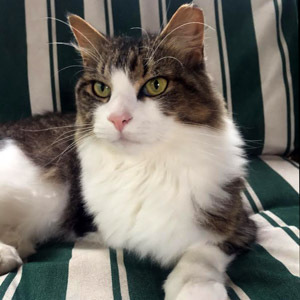 He also needs a moderately playful cat who likes to be chased when playing and who won't be intimidated by Fluffy's lack of 'kitty etiquette.' Fluffy is still learning how to play with other cats. He's done pretty well interacting with the other foster cat in his foster home – Butterscotch. Fluffy clearly had a home at some point. Having lived outdoors for at least a year, we can only imagine what he lived through. Because his right front leg had severely torn tendons, his leg had to be amputated. Most cats do great on three legs – they just need a little time to get their bearings and not feel vulnerable. 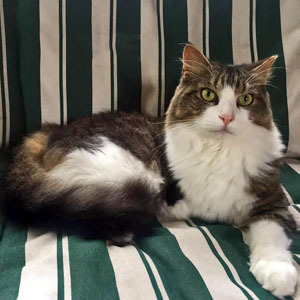 Fluffy is no exception – he races around, runs up and down carpeted stairs, and jumps up and down couches and beds with ease. He also has no problem jumping in and out of his high-sided litter box and buries his waste with gusto. Fluffy managed to survive outdoors hobbling around on three legs. A kind woman spent months feeding him and gaining his trust. Once she discovered that Fluffy was a sweet, social cat, she reached out for help. If you have a big heart AND the right home environment (quieter with a friendly cat and hopefully a screened-in porch! ), please consider adopting Fluffy. He will reward you with lots of purring and love.